Your Next Stamp New Release Day Two! I was browsing the $1.00 section at Target when I saw this little watering can. They also had some gardening gloves and flower seeds, and the idea hit me! April showers bring May flowers! How perfect for Rainy Day Fhiona :) These little Mini Fhionas are the perfect size for tags and this was so fun to make! I printed the sentiment on some Pretty in Pink cs, cut it out with a Labels Two Nestability and embossed it with my Swiss Dots Folder. I punched some grass using my Martha Stewart Grass Border Punch, and cut that out with my Labels Two Nestability as well. Then I just cut out Fhiona, popped her up, and added some punched flowers. Super cute and easy! This is beautiful Kerri!! I just love your gift set!! The coloring, colors, dry embossing and your sweet watering can!! What a wonderful set!!! Love the image and this gift set is adorable! Oh this is such a sweet little gift set. Your tag looks DARLING! Wonderful project!! So perfect for gardening and this time of year. I love the image and the embossing on the tag too! Wonderful idea ! Love this cute set ! You have done some beautiful work recently. Love the photos of the children too ! So sweet ! Brillant Kerri! I love your little gift pack and your Rainy Day Fhiona tag is soooo cute! So many people find cool things at the Target Dollar Spot - I need to browse it...I usually just jet right past it. Love this little can - for $1?? How cute is that for packaging a little gift - - like you have here. And that little mini girl and taggie are sooo cute! Kerri this is sooooo super cute!!!! LOVE this idea! It's such a great gift idea for someone who loves plants and gardening. 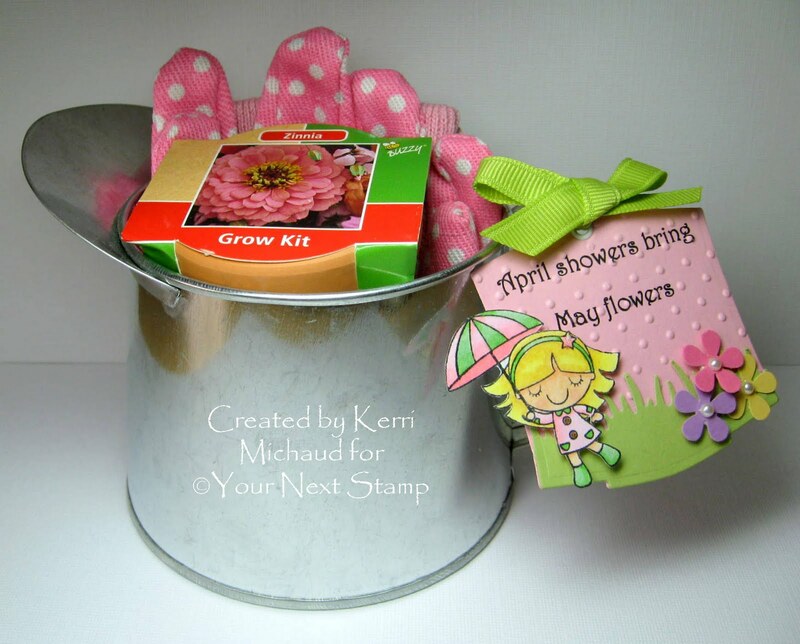 Fun and cute gift pack Kerri! Wonderful gift for spring Kerri! Love the cute tag you created! What a fabulous little tag!!! And a great gift idea for any gardener. I love the polka dot gloves!!! Such a great little gift! Love how it all fits in that cute little watering can!